Account of Shore Contact's experience when DolphinGal sends 911. Account of Wizard's participation in the inaugural Ultimate Florida Challenge in Enigma. Account of Ridgerunner and Greybeard’s participation in the Inaugural North Carolina WaterTribe Challenge, September 2009. Account of Stripbuilder’s participation in the Inaugural North Carolina WaterTribe Challenge, September 2009. Account of HoldYourCourse’s participation in the Inaugural North Carolina WaterTribe Challenge, September 2009. Dawn Stewart I've Been Krugerized! Is This Boat Up To a WaterTribe Challenge? It's not for the fun, it's for the adventure! A dual purpose coastal cruiser. Winning wasn't easy but we did have some luck. The Michigan Challenge In a Bubble; or What Was He Thinking? When Mother Nature gets nasty, will you survive? This simple kit can save your life! Make a poncho from one of your space blankets. Everything you need for a fast and light expedition or a WaterTribe Challenge. 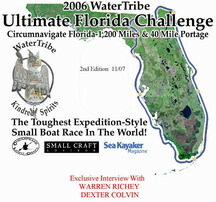 Most paddlers or sailors don't finish a WaterTribe Challenge the first time out. Read this and increase your chances. Does your dream expedition require a long portage? Learn how to two 40 miles or more.